Dr. Warrier practices at the Allergy, Asthma & Sinus Care Center, specializing in the treatment of children and adults with allergies, asthma, and immune deficiencies. Prior to joining the Allergy, Asthma & Sinus Care Center in 2008, he was on faculty at the Cincinnati Children’s Hospital Medical Center in the Division of Allergy and Immunology. Dr. Warrier earned his bachelor’s degree from Centre College in Danville, Kentucky and his medical degree from the University of Louisville School of Medicine. He completed a combined Internal Medicine-Pediatrics Residency at St. Louis University Health Sciences Center and Cardinal Glennon Children’s Medical Center, and Fellowship in Allergy and Immunology at St. Louis University. Dr. Warrier is currently certified by the American Board of Allergy and Immunology. He has also passed certification exams from the American Board of Internal Medicine and the American Board of Pediatrics. 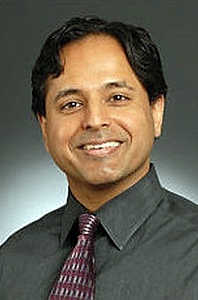 He has been an invited speaker for American Academy of Allergy, Asthma & Immunology (AAAAI) and Continuing Medical Education meetings and has twice been awarded the Outstanding Junior Faculty Pediatric Abstract Award presented by the American Academy of Pediatrics Section of Allergy and Immunology at the AAAAI. He has coauthored several papers, including studies on food allergy (“The Prevalence, Severity, and Distribution of Childhood Food Allergy in the United States” published in Pediatrics in 2011 and “Parent Report of Physician Diagnosis in Pediatric Food Allergy” published in the Journal of Allergy and Clinical Immunology in 2012). Dr. Warrier has a very strong interest in food allergies, since his older daughter suffers from peanut, tree nut, and chickpea food allergies. He is actively involved in the Internal Medicine Residency Training Program at SSM St. Mary’s Health Center and the Allergy Immunology Fellowship Program at St. Louis University. Dr. Warrier is a Clinical Associate Professor in the Division of Allergy and Immunology at St. Louis University. A curious case of cough. Vitale, J.,Caruthers, C.,Warrier, M. R.; Ann. Allergy Asthma Immunol.. 2015 Jan 28. The epidemiology of milk allergy in US children. Warren, C. M.,Jhaveri, S.,Warrier, M. R.,Smith, B.,Gupta, R. S.; Ann. Allergy Asthma Immunol.. 2013 May. Parent report of physician diagnosis in pediatric food allergy. Gupta, R. S.,Springston, E. E.,Smith, B.,Pongracic, J.,Holl, J. L.,Warrier, M. R.; J Allergy Clin Immunol. 2013 Jan. The prevalence, severity, and distribution of childhood food allergy in the United States. Gupta, R.S., Springston, E.E., Warrier, M.R., Smith, B., Kumar, R., Pongracic, J., Holl, J.L. ; Pediatrics. 2011 Jul. IL-13R&Icirc;&plusmn;2 has a protective role in a mouse model of cutaneous inflammation. Sivaprasad, U., Warrier, M.R., Gibson, A.M., Chen, W., Tabata, Y., Bass, S.A., Rothenberg, M.E., Khurana Hershey, G.K.; J Immunol. 2010 Dec 1. Matrix metalloproteinase 8 contributes to solubilization of IL-13 receptor alpha2 in vivo. Chen, W., Tabata, Y., Gibson, A.M., Daines, M.O., Warrier, M.R., Wills-Karp, M., Hershey, G.K.; J Allergy Clin Immunol. 2008 Sep.
Asthma genetics: personalizing medicine. Warrier, M.R., Hershey, G.K.; J Asthma. 2008 May. Allergen-dependent solubilization of IL-13 receptor alpha2 reveals a novel mechanism to regulate allergy. Daines, M.O., Chen, W., Tabata, Y., Walker, B.A., Gibson, A.M., Masino, J.A., Warrier, M.R., Daines, C.L., Wenzel, S.E., Hershey, G.K.; J Allergy Clin Immunol. 2007 Feb.
Allergy-driven alternative splicing of IL-13 receptor alpha2 yields distinct membrane and soluble forms. Tabata, Y., Chen, W., Warrier, M.R., Gibson, A.M., Daines, M.O., Hershey, G.K.; J Immunol. 2006 Dec 1. Epicutaneous aeroallergen exposure induces systemic TH2 immunity that predisposes to allergic nasal responses. Akei, H.S., Brandt, E.B., Mishra, A., Strait, R.T., Finkelman, F.D., Warrier, M.R., Hershey, G.K., Blanchard, C., Rothenberg, M.E. ; J Allergy Clin Immunol. 2006 Jul. Level of expression of IL-13R alpha 2 impacts receptor distribution and IL-13 signaling. Daines, M.O., Tabata, Y., Walker, B.A., Chen, W., Warrier, M.R., Basu, S., Hershey, G.K.; J Immunol. 2006 Jun 15. Allergic bronchopulmonary aspergillosis in a patient with cystic fibrosis: diagnostic criteria when the IgE level is less than 500 IU/mL. Knutsen, A.P., Noyes, B., Warrier, M.R., Consolino, J.; Ann Allergy Asthma Immunol. 2005 Nov.
Fresh frozen plasma in the treatment of resistant angiotensin-converting enzyme inhibitor angioedema. Warrier, M.R., Copilevitz, C.A., Dykewicz, M.S., Slavin, R.G. ; Ann Allergy Asthma Immunol. 2004 May. IL-4 alpha chain receptor (IL-4Ralpha) polymorphisms in allergic bronchopulmonary sspergillosis. Knutsen, A. P., Kariuki, B., Consolino, J. D., Warrier, M. R.; Clin Mol Allergy. 2006.